The 12th Annual Conference on VISION 2020 INDIA was held in Pune on 4-5 June 2016. About 600 delegates from all the key organisation and Hospitals engaged in Eye Care were present during the Conference. More than 10 papers were presented from Sightsavers and its partners. A paper was presented on ‘Everybody Counts: Learnings from data disaggregated by disabilities (DDD) pilot project’ in the track Emerging Practices in Affective Outreach. The paper was based on the pilot conducted in Bhopal as part of DDD Project. On behalf of Sightsavers, Archana Bhambal, Area Director, presented the paper. The paper got awarded the best paper presented in the track. This recognition surely tells how important the subject is and we need more efforts to share this on bigger platforms. 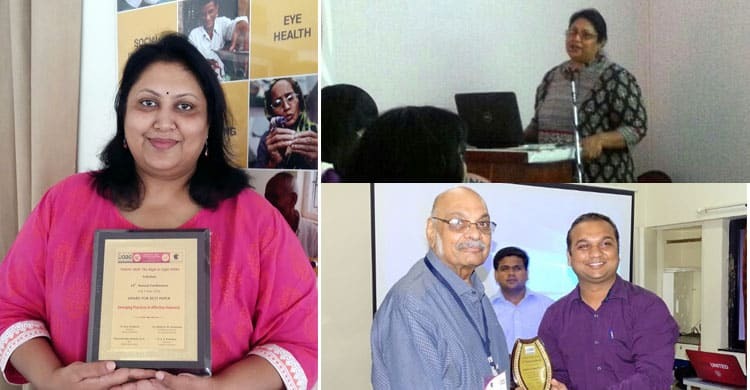 One paper was presented by our partner, Dr. Rajesh Saini, Administrator from Sewa Sadan Hospital on Reaching out to urban slums of Bhopal – ‘Amrita Drishti’ MP Urban Slum Eye Care Programme. This paper also got the best paper award in the track Sharing Knowledge Repository : Towards Organisation’s Sustainability and growth.